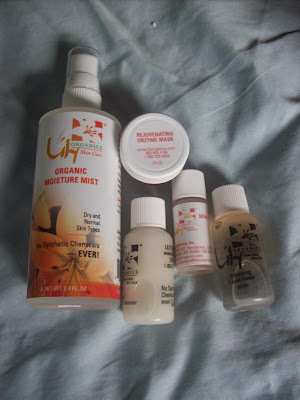 Lily Organics sent me some samples of their products for review. The products are USDA certified organic which is very cool. I really like the moisture mist that I was sent. You spray it on your face for moisture. This is great for me because I have very dry skin! I think that this will be perfect for the winter when there is low humidity. I also got to try a toner, cleanser, and an enzyme mask. Here is what the company has to say: Since 1986, Lily has been handcrafting fresh batches of her award-winning skincare in Colorado. Using absolutely no synthetic chemicals ever, Lily Organics is the only facial care line on planet Earth to grow its own ingredients on their own USDA Certified Organic farm and make fresh products weekly in their own FDA-inspected lab. While others may try, Lily remains the one and only USDA Certified Organic skincare company to harvest and produce its own products, based on the experience and knowledge of 7th generation American farmers. I really like this brand and would use it again! Thanks Lily Organic.